When Amazon unveiled its Dash Button on March 31, 2015, many wondered if it was an early April Fool’s joke. Earlier this summer, in fact, Amazon revealed customers make purchases through Dash Buttons four times every minute—up from about one per minute a year ago. Moreover, for some products—e.g., 46.5-ounce All Liquid Laundry Detergent, 10.3-ounce Folgers Medium-Dark Roast Ground Coffee—greater than half of all orders are now transacted through Dash Buttons. But Dash’s coming of age is perhaps best evidenced by the expanding list of featured brands: from about 12 popular brands in 2015 to over 300 today. And not just the number but the variety as well. From Play-Doh to Calvin Klein Underwear, DRS boasts an impressive assortment of name brands. Yet one all-important question remains: Is Dash pushing all the right buttons with customers? To understand customers’ Dash Button usage, as well as the specific brands they’re using, Field Agent targeted 100 verified DRS users with a 10-question mobile survey. As the video demonstrates, respondents were required to capture photos and video of their branded Dash Buttons. The full results are available below for you to view, download, and share. Dash Button owners like their devices, particularly for their convenience and speed. Field Agent's mobile survey found 63% of users are completely or very likely to purchase additional buttons in the future. Moreover, 44% say they're making more frequent purchases of a specific brand since using its Dash Button. See Also: Explore the rise of online grocery shopping. Download Groceries 2.0 Revisited today! The one-click, replenishment system is especially popular for household consumables like trash bags, toilet paper, and the like. Indeed, in our survey of 100 owners, Glad Trash Bags were more prevalent than any other Dash Button. DRS isn't, however, without opportunities for improvement. Specifically, Dash owners wish their buttons had more purchase options and were less prone to accidental/duplicate orders, among other things. Explore the rise of online grocery shopping in this completely updated and widely expanded second edition to our popular original report. 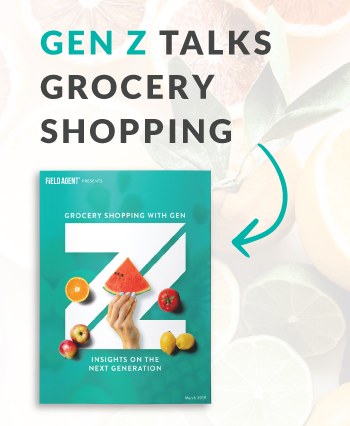 Authoritative and entertaining, Groceries 2.0 Revisited encompasses 11 mobile studies, 5,890 survey responses, and 116 mystery shop responses. So come along as we examine the rise of online grocery shopping; join hundreds of business professionals who have already downloaded this free report!